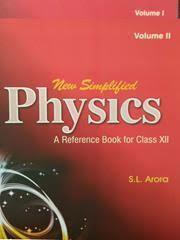 New Simplified Physics: A Reference Book - Class 12 is a set of two volumes, which comprehensively covers the entire Physics syllabus of Class 12th. Students who want to excel in their final examinations should study from this guidebook.Physics is an academic discipline which helps us understand how the universe behaves. It can be broadly categorised into two parts, namely Classical Physics and Modern Physics. The first branch covers laws that are highly applicable in everyday scales. Modern Physics is used to describe laws that have been developed in the early 20th century and onwards. It focuses on quantum mechanics and the interactions and behaviours of matter and energy.